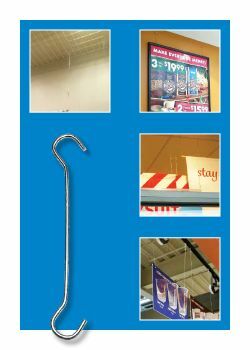 Stocked In 7 Popular Sizes, 4", 6", 8", 12", 18", 24" and 36"
Double C hooks are very useful ceiling hanging accessory products used in many retail outlets such as individual stores and in malls. They can connect to a wide variety of ceiling connectors and are available in multiple sizes depending on your specific need. Count on Clip Strip Corp for all your store fixture and equipment needs. Unsure if the product will work, ask our customer service (1-800-425-4778) for free samples to test them out. Minimum quantity for "4" Double C Hook, DBC-4" is 50. Minimum quantity for "8" Double C Hook, DBC-8" is 50. Minimum quantity for "6" Double C Hook, DBC-6" is 50. 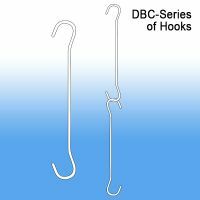 Minimum quantity for "12" Double C Hook, DBC-12" is 50. Minimum quantity for "18" Double C Hook, DBC-18" is 50. Minimum quantity for "24" Double C Hook, DBC-24" is 50. Minimum quantity for "36" Double C Hook, DBC-36" is 50.